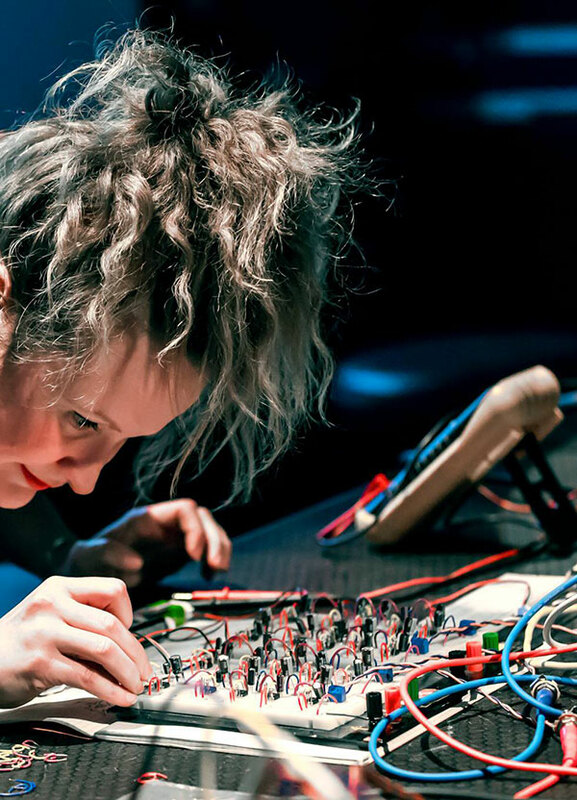 20 Oscillators in 20 Minutes is a performance by Darsha Hewitt, staged at the 2015 Chaos Computer Club’s Chaos Communication Congress. Hewitt builds twenty small electronic circuits with wires, chips, small components and nine-volt batteries in twenty minutes. The time element is obviously critical to this performance as it demonstrates a scale of forced human production that translates into a minimal orchestra of synthetic sounds. Hewitt is also facing live troubleshooting, which in turn she defines as “a method of musical improvisation”. The resulting work is part sound and part electronics production because the artist is working under time constraints and is therefore limited to very specific and economic gestures. An important part of Hewitt’s performance is to interact with the public, explaining and commenting, and even asking for help, culturally transforming a technical challenge into an implicitly collaborative social environment.